Please refer to our stock # 2065 when inquiring. 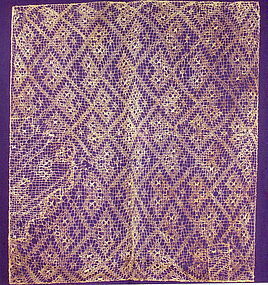 Spectacular Chancay lace textile panel, Peru 900 - 1300 CE. Delicate and finely woven while fashioned into lace pattern and temporarily stitched to a blue cloth backing. In excellent condition. Lace measures 34 1/2" x 38". Ex: Jean-Eugene Lions collection, Geneva. The best known of the Chancay artifacts are textiles that consist of embroidery work, paint-decorated fabrics, gauzes and three-dimensional groups of dolls. Among others, shades of yellow and brown, scarlet, white, lavender-blue and olive green were the colors used. Birds and a deity wearing a crescent-like headdress have been the most popular decorative motifs. Thousands of Chancay textiles have been preserved to this day, so their ancient production must have been remarkably extensive. However, the quality of the textile material has not suffered from this, and the Chancay material is always well finished off and carefully made.